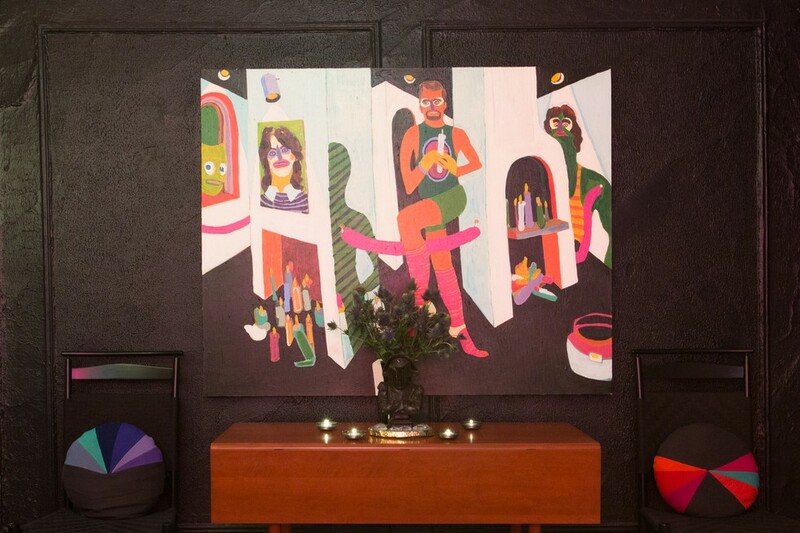 "My decorating taste is 'gothcentric,' I suppose," New York-based artist Desi Santiago says. "I'm always drawn to things that evoke a sinister mood whether it be direct or through a charming, cartoon guise." Inside his Harlem home, you'll find funerary emblems, santería talismans, and, oh yeah, his old club kid ID. As a teen growing up in Newark, Santiago says he'd take the PATH into Manhattan every day after school and, inspired by the goings-on at legendary clubs like The Pyramid and Mars Bar, he began creating an over-the-top persona -- Desi Monster -- and hanging out at spots like the Limelight and Palladium with a crew that included famous (and infamous) scenesters like Michael Alig and James St. James. And while you still might find Santiago at a roving warehouse dance party every now and then, you're more likely to see him at an art opening or fashion show, two cultural spheres that he's comfortable moving fluidly back-and-forth. His work includes sculptures, costumes and experiential installations seen everywhere from the Met (masks and headpieces in McQueen: Savage Beauty), to Paris' Musee des Arts Decoratifs (an elaborate installation for the Louis Vuitton/Marc Jacobs retrospective) and Art Basel Miami (a massive takeover of the Lords South Beach and transformation of the hotel into, as Santiago says, "a fortune telling creature" that bore a striking resemblance to his black dog, Gypsy). 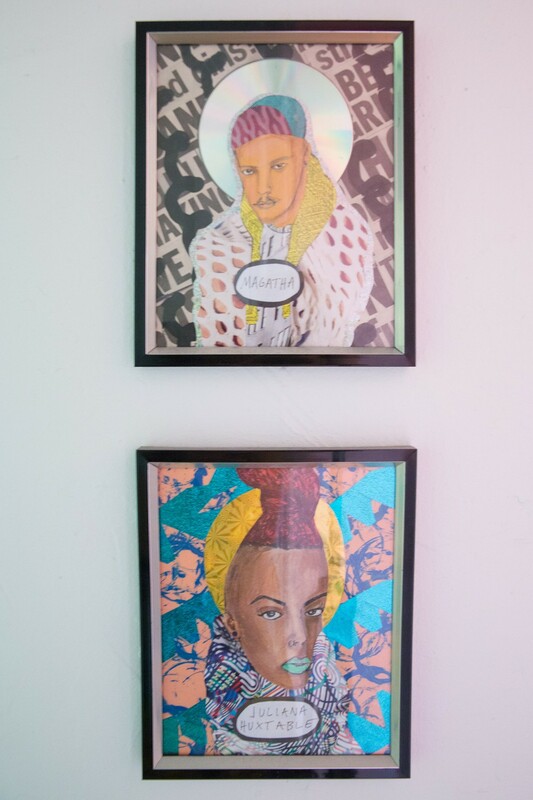 PAPER's Rebecca Smeyne had the chance to see some of his art up close in person -- along with his santería machete, an art piece featuring a "voguing confederate demon" and a collection of owls -- when she recently stopped by his home. "This is my living room with yellow leather furniture and black walls. The black walls help me imagine new work. The curtains are bleached out American funerary flags. On the ottoman is my best friend and muse, Gypsy. She often disappears into the black walls and black carpet but quite often reappears in my artwork as in the portrait of her behind us titled 'Gypsy in Pink' from a show at my gallery Envoy Enterprises." 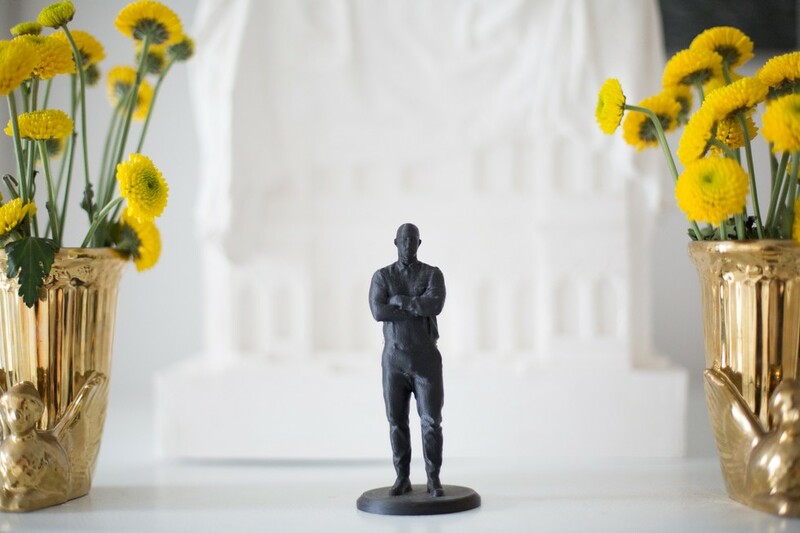 "This is a 3D print of me produced as a collectors item for Crush Fanzine who published an entire issue dedicated to me and my world. On either side are gold sphinx vases I found at a flea market." "I love Shaker furniture and this is a table and two chairs in Shaker style. On each chair are pillows by Jarrod Glaze. The painting is by a good friend and artist, Nolan Hendrickson. I am very much into gifts from friends and peers whose work I admire. 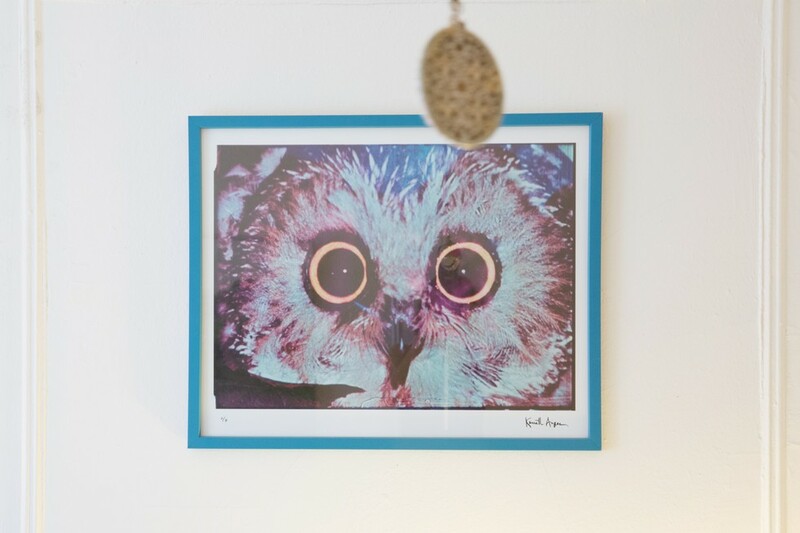 I surround myself with these things as they give me comfort and inspiration." "This is my club kid trading card we produced during the club kid days at Disco 2000. 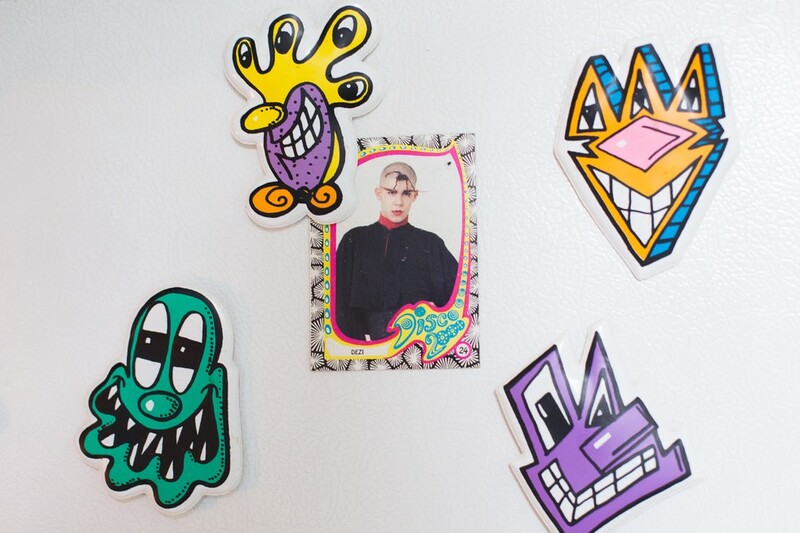 It's being held and surrounded by Kenny Scharf magnets he gave me at a dinner in his home...I was a goth-industrial type wearing long capes, my hair sprayed into devil horns and drawn on Dr. Spock eyebrows while attending a private Catholic School in Newark, NJ. I was very antsy to get out of Newark and would take the PATH train to NYC almost everyday after school to hang out in the village. I started going out to night clubs at 15. The Pyramid, Red Zone, Quick and Mars were some of the first ones I went to and I was hooked. The Limelight, of course, became [the club kid] home base and fulfilled my revenge fantasies on Catholic school and religion by being completely debaucherous in a former Church. The Palladium was an amazing cavernous space unlike any other after it." "This is in the bathroom. 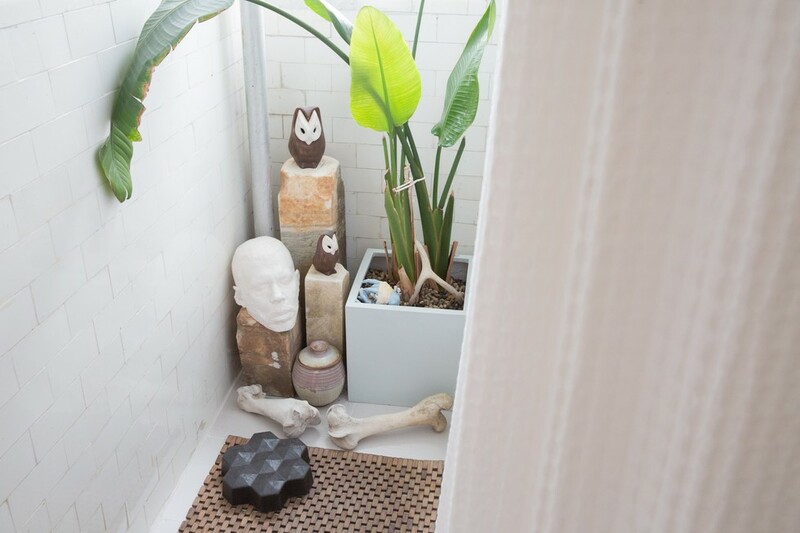 My banana plant is surrounded by ceramic owls given to me by Jarrod Glaze sitting on marble cemetery markers given to my by his father, Jaques Glaze. There is a plaster cast of my head and a rubber sculpture by artist and musician David Riley of the band Mirror Mirror, a souvenir from their music video I starred in. On the floor are horse bones given to me from a friend a long time ago from their hike in the Rocky Mountains." 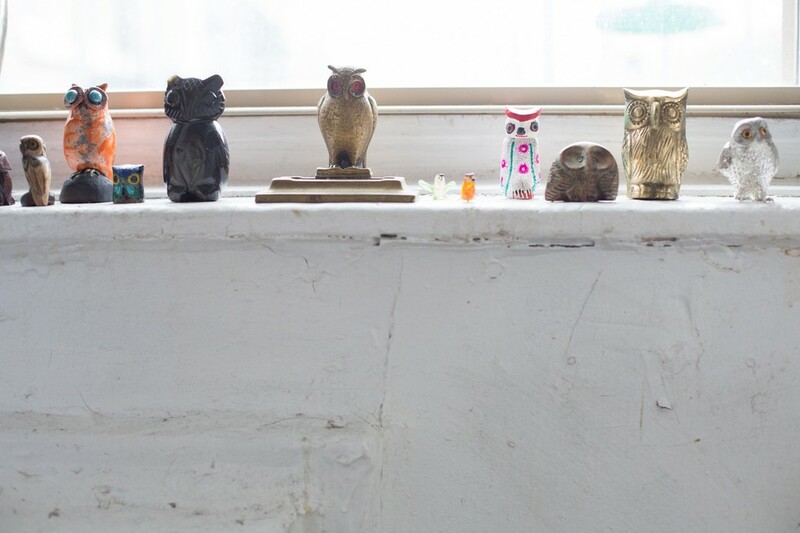 "This is a collection of owls on my kitchen window shelf given to me throughout the years from various friends." "This is a Kenneth Anger print from a show of his film stills." 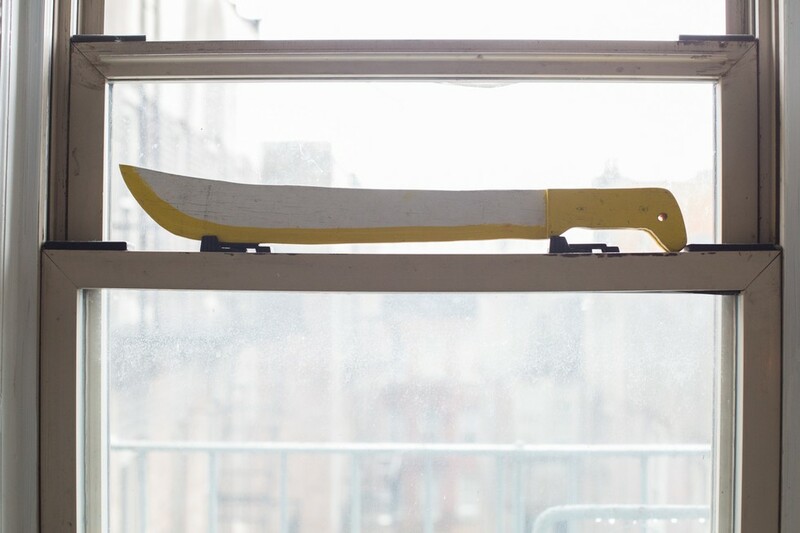 "This is a wooden machete that sits in my kitchen window. It is a ceremonial piece in Santería for the orisha [spirit], Ogun. I am drawn to this deity as he is the patron of metalsmiths, knives, war and his Christian incarnation is as Saint James, which is translated into Santiago. He is also accompanied by the black dog. There's a clear synchronicity here for me. This machete was a birthday gift from Viva Ruiz and Gavin Russom of the band, The Crystal Ark. I also have a music project I do with Viva called Escandalo." 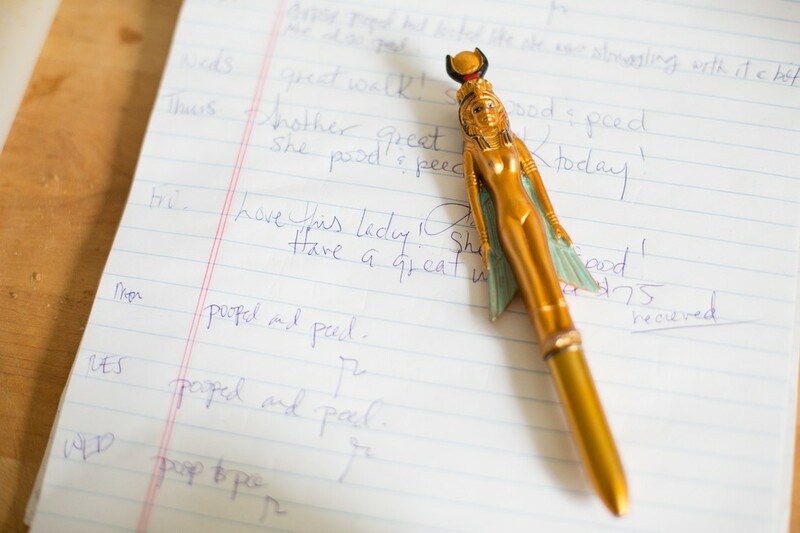 "This is my Egyptian goddess Isis pen I found in Tokyo. I love it. It sits on a notepad where my dog walker gives me updates on Gypsy's walks, poops and pees." 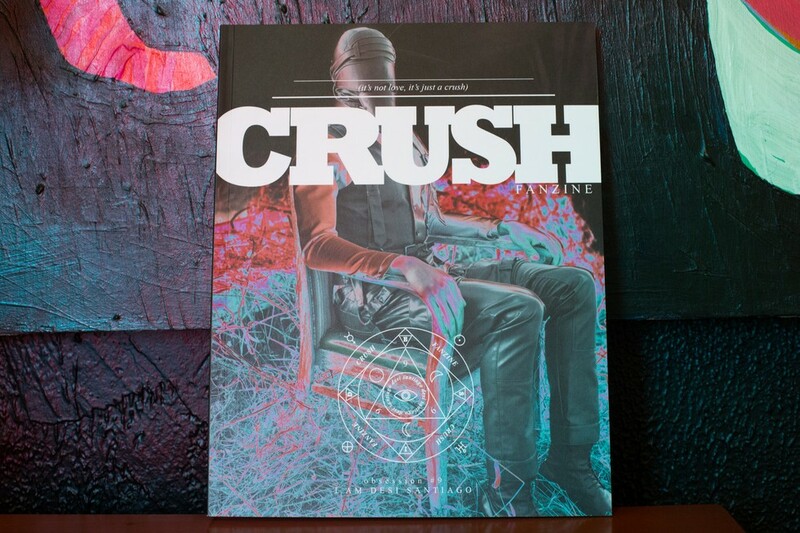 "This is the issue of Crush Fanzine which was entirely about me and my work. It is a collection of photography, writings and interpretations by various artists. I was honored to be the subject." "These are two pieces by Adam Radakovich I purchased from an exhibition from the House of Ladosha. On top is DJ Michael Magnan and on the bottom is Juliana Huxtable." "This is on the desk in my bedroom. 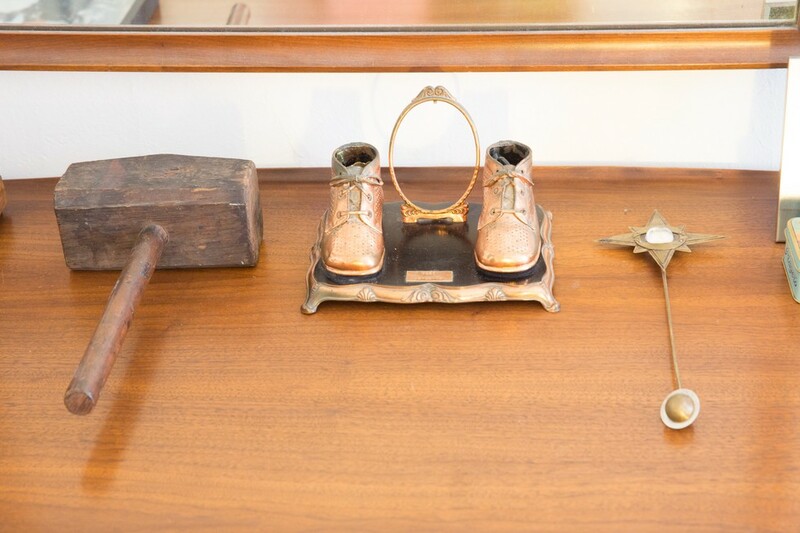 From left to right is a wooden mallet I found at a barn sale upstate, then my bronzed baby shoes, and last is the first piece I ever created as a metalsmith, a magic wand. I was originally trained as a metalsmith in Parsons School of Design creating small scale and wearable sculpture. I then received my Masters in sculpture from Bard College upstate. I've incorporated all mediums I've worked with during the years into my work. I create sculpture, costume, and experiential installation." "Alongside a stack of art books is a photograph I purchased at an art fair. It's an image of Mathu and Zaldy by Josef Astor. Both good friends of mine and an amazing documentation of a strong creative partnership at a moment in time. I love this image so much." "This is a view from my kitchen into the entrance foyer. 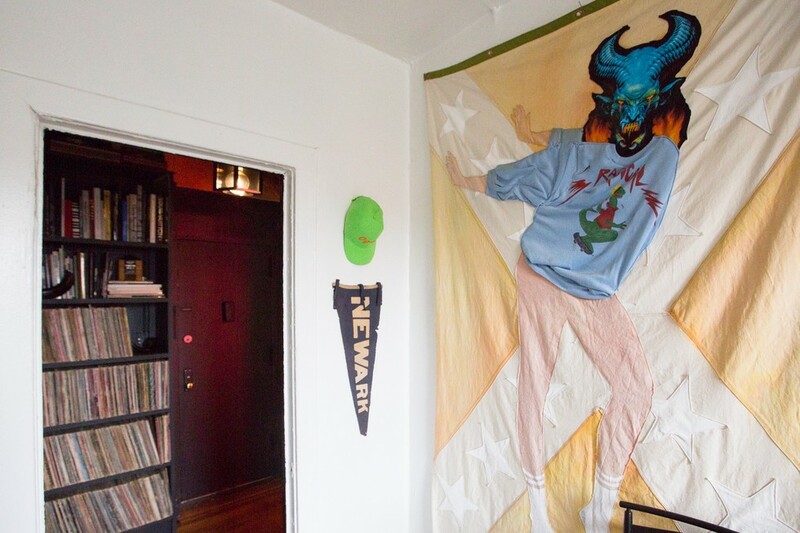 The large panel on the wall is by artist Jared Buckhiester of a voguing confederate demon. Next to that is a Newark pennant I found in an antique shop upstate. Newark is my hometown. It hangs under a baseball hat that reads "Ogun," given to me by Viva Ruiz and Gavin Russom along with the machete. In the foyer are my record collection I inherited from my brother, Johnny, who passed away in 1992 of AIDS. 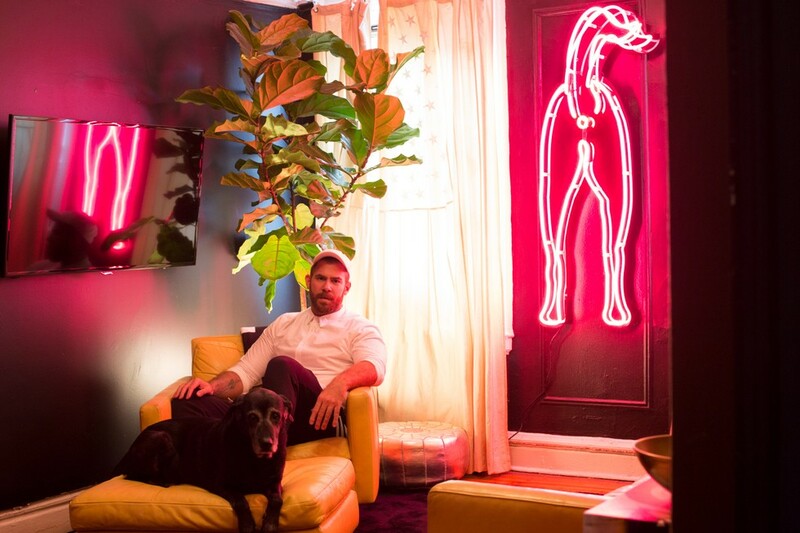 He was a DJ and artist who was my main influence to move to NYC and become what I am today." "This is my refrigerator. This was also a gift from Viva and Gavin on my birthday. They went shopping that day to a Harlem botanica [occult store]. It translates into 'Eye and Tongue.' The skeleton magnets I found at the Mori museum gift shop in Tokyo."